What a fun day with Hofstra Rock Climbing Club! My name is Michelle, and I'm a Junior from Newtown, CT. 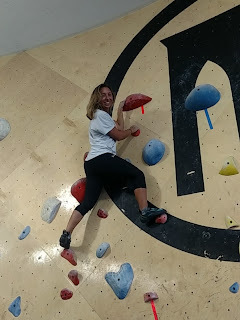 Fellow Pride Guide Jane and I tried out this awesome sport for the first time this Saturday at Brooklyn Boulders. There was a group of about 40 students, some veterans of the club, and some newbies just like us! After getting acquainted with each other, we started bouldering. This is going up short paths without the use of a harness. It's on a "v scale" so V0 is the easiest and as you go higher up, it gets increasingly harder. I started off at V0 but I got to V2, which I've never done before. I was extremely proud of myself! We then started top-roping, which is climbing up taller paths with the use of a harness. Jane had to strike a pose! It's on a five-point scale so 5.6 is fairly easy. I climbed up a 5.8 to give myself more of a challenge. The veteran climbers were super helpful providing tips to me and other new members. I tried a 5.9 to really push myself, but by the end of the day my arms and legs were beat. However, the people in the club were very supportive and helped you strategize how to get up a path if you were struggling. Hanging (literally) out with the Hofstra Rock Climbing Club was a great full-body workout and a fun way to make friends! Rock Climbing Club's newest members!